At Mills Teacher Scholars, we support our partner teachers to build their inquiry stance, allowing questions and curiosity to drive instructional improvement. Kindergarten teacher scholar Brook Pessin-Whedbee’s inquiry journey is an example of this core value in action. After a thirty minute Writer’s Workshop period, Aaron’s story read, “I PLAD SCR WIF MY DAD. MY BRUDR WZ DER.” It was disconcerting to see how a story with such detailed and imaginative content could be so limited by Aaron’s newly developing skills in the complicated mechanics of writing. Brook sat with a puzzle in her teaching practice. She knew well the depth of creativity and the limitless imagination in her Kindergarteners. And yet, the trouble with Kindergarten writing is that the stories they can write are limited, at best, to a few sentences. Some children spend nearly the entire year simply learning how to hold a pencil, form the letters of the alphabet, and leave spaces between words. How, then, she wondered, could Kindergarteners like Aaron make their voices heard? How could they communicate the rich content and complexities of their oral stories in their own writing? This curiosity is what drove Brook’s inquiry process and led her to make some profound and effective changes to her practice. Thinking about kids like Aaron who lacked skills, or confidence in their skills, she created a separate space in her classroom for a new kind of Kindergarten writing. She still had daily Writer’s Workshop time, but she also began to incorporate Story Play Time each month. Story Plays are children’s made-up stories that they develop in partners through drawing and talking, dictate to a teacher and act out and revise as a class. Aaron and Yani spent several months together creating a story about a cave where two sharks chase a skateboarder in and out of an ice hole and finally melt to the bottom of the sea. Brook spent the year studying how the Story Play process unfolded in the classroom, as children explored story elements such as character, setting, dialogue, problem and solution and engaged more deeply in aspects of the writing process such as rereading and revision. 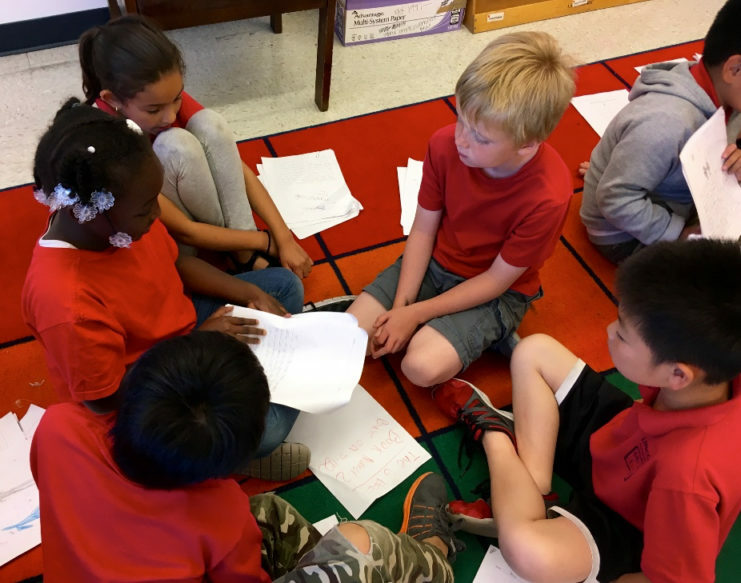 As her students worked towards publishing their own books, she saw the content elements and story structure that she had taught during Story Play time showing up organically during Writer’s Workshop. Seeing this powerful transfer of skills made it clear to Brook that Story Plays was actually improving academic outcomes for writing standards as students explored story elements through collaborative talk, drawing, and acting, and then made connections to their own writing. Through allowing her curiosity about Kindergarten writing to drive her instructional decisions, Brook achieved measurable success in learning outcomes with her students. Read Brook’s story in her own words. How, I wondered, could Kindergarteners like Aaron make their voices heard? How could they communicate the rich content and complexities of their oral stories in their own writing? This was where I started in my Mills Teacher Scholars inquiry process.